Our story is the first drama in recorded history, repeated every day inside of each of us: the battle between mind and matter. 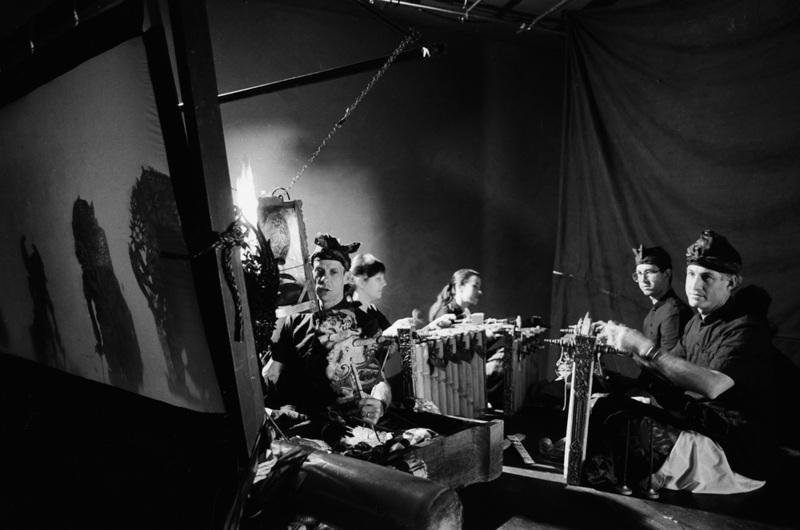 The Ambrosia of Immortality is a rarely seen episode of the Mahabarata, that precedes the traditional repertoire of Wayang Bali. A cast of 9 masked actor/shadowcasters performing with shadowmasters I Wayan Wija and Larry Reed. Five musicians create the sound of a full gamelan orchestra by combining live instruments and digital sampling. One thinks of heaven as a place of peace, but as our story begins the universe is askew. In the heavens, war rages between the gods who have it all and the former gods (demons) who want it all back. Both sides are tired of fighting. They go to Wisnu, the Preserver, to present their grievances. Wisnu offers a solution: a great endeavor requiring both the skill of the gods and the strength of the demons. Together they must churn the Milky Ocean to create the essence of life -the ambrosia of immortality. In order to do that, they must uproot a great mountain, and convince the King of the Snakes to serve as the rope to spin the mountain. Both sides are skeptical but become obsessed with succeeding in this epic test of faith. Sages of old looked deep into their minds and saw universe upon universe created, preserved, and destroyed. They called the creator Brahma; the preserver Wisnu; and the destroyer Siva. They counted eons, gazed through light years, investigated thought and form and sacred sounds, and distilled their understanding into stories for us to experience. Their insights led them to an understanding of simple things: day/night, hot/cold, soft/sharp, pleasure/pain, good/bad. Nothing exists without its opposite. The trick is to keep things in balance. Reed is a pioneer in this big-screen, cinematic approach.